One of the most popular attractions at our Funfair and Christmas events is the Roll A Ball hires! 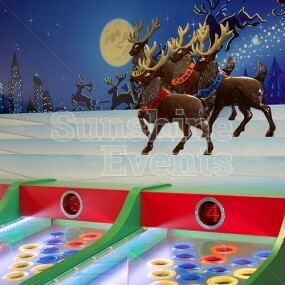 Available as the classic horse racing Donkey Derby, or a festive Reindeer Racing option, these large impressive looking games are absolute showstoppers at events and we invite you to bring the fun to your event too! The game itself is simple: roll the ball up the alley to get it to drop down one of the coloured holes. Sound easy? Woah there nelly! It’s harder than it looks - roll too hard and your ball won’t even get into a hole - roll too softly and you might not even make it all the way there! It’s a challenge. Meanwhile your three opponents seem to be doing much better than you...your competitive nature will shine through! There’s always a good reason to bring the Roll A Ball games to your events. The Reindeer Racing option is perfect for all kinds of Christmas events, or Corporate Parties, Weddings, or Birthday Parties that fall within the festive period and the Donkey Derby is so versatile and addictive that it will be a welcome addition to all kinds of events - even if it isn’t a themed event. 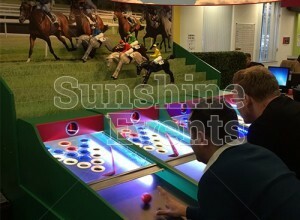 Add in a trained Fun Expert and you’ve got a game that not only tests your skills but also entertains the crowds as they commentate on the race as it happens. 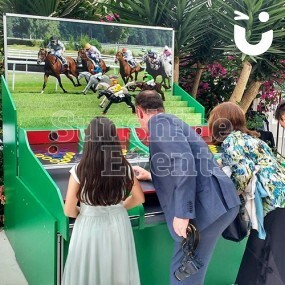 The Roll A Ball Hire is great fun for all ages and sure to entice people in with it's fantastic appearance and addictive gameplay, and most importantly it’s a piece of equipment that will ensure your event stands out in the minds of your guests for years to come! 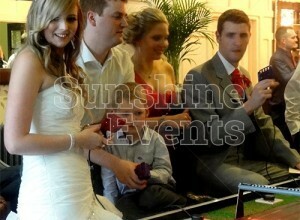 Everything you see on the Sunshine Events website is owned and maintained by us, so you can be sure that when you hire when from us - what you see is what you get. 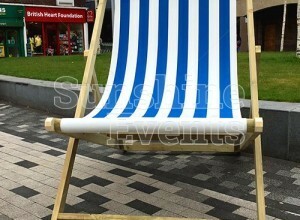 And with over 10 years’ experience in events across the UK, you’re hiring from a company that you can trust. Check out our CustomerSure reviews, added live on our website by our happy customers, if you need any further reassurance. Add in the £10 million Public Liability Insurance, risk assessments, method statements and more available from our website, any documentation you might need for your venue is all taken care of. All you need to do is have fun on the day! Head over to the Roll A Ball Gallery to see some great photos from events that we have done in the past - it’s only a click away!